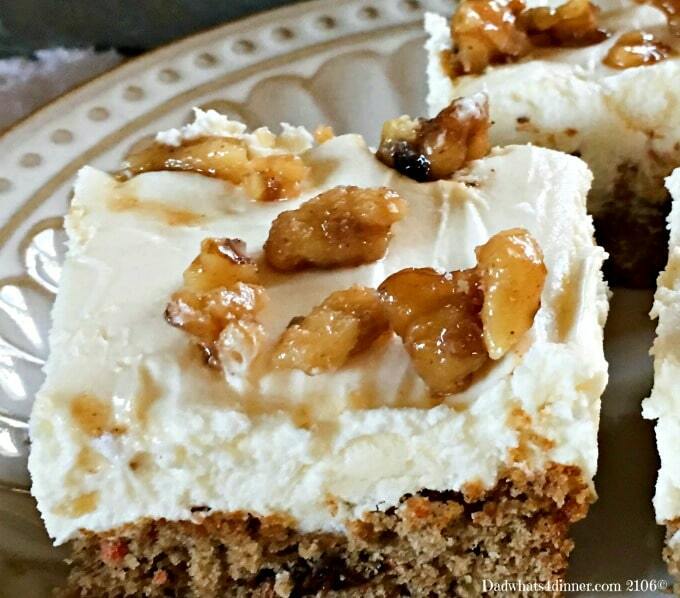 So here is your last-minute treat to bring to the cookout. I know you are sitting there trying to think of something festive and creative; well this is the recipe you have been looking for. 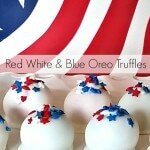 Red, White and Blue Oreo Truffles: a quick, no bake, easy dessert, that looks great. I came up with this recipe last night while looking at all of the very creative July 4th recipes on Pinterest. I actually typed my idea into my phone around 12:30 this morning. These truffles can be made the night before, just keep refrigerated. Place Oreo’s in food processor and pulse until crushed to form fine crumbs. In a stand mixer, mix Oreo crumbs, cream cheese, and salt until completely blended and no cream cheese pieces are showing. Divide dough in half. Return half of the dough to stand mixer and add red food coloring. Adjust coloring as needed until correct color is achieved. Clean mixing bowl and repeat process with second half of dough and blue food coloring. Prepare a baking sheet by lining it with parchment or wax paper. Use a melon baller or small ice cream scoop, to form a ball and place on baking sheet. Place balls in the freezer for at least 30 minutes. Remove balls from freezer and roll each in your hands to form a smooth round ball. Freeze for another 10 minutes. Melt 1/4 of candy coating according to package directions. Working in batches, about 10 at a time, use a toothpick to dip the ball in coating allowing excess to drip off and place on a new baking sheet lined with parchment. Remove toothpick and use a spoon to place a small dab of coating over the hole and add star sprinkles. Repeat with remaining balls and candy coating. 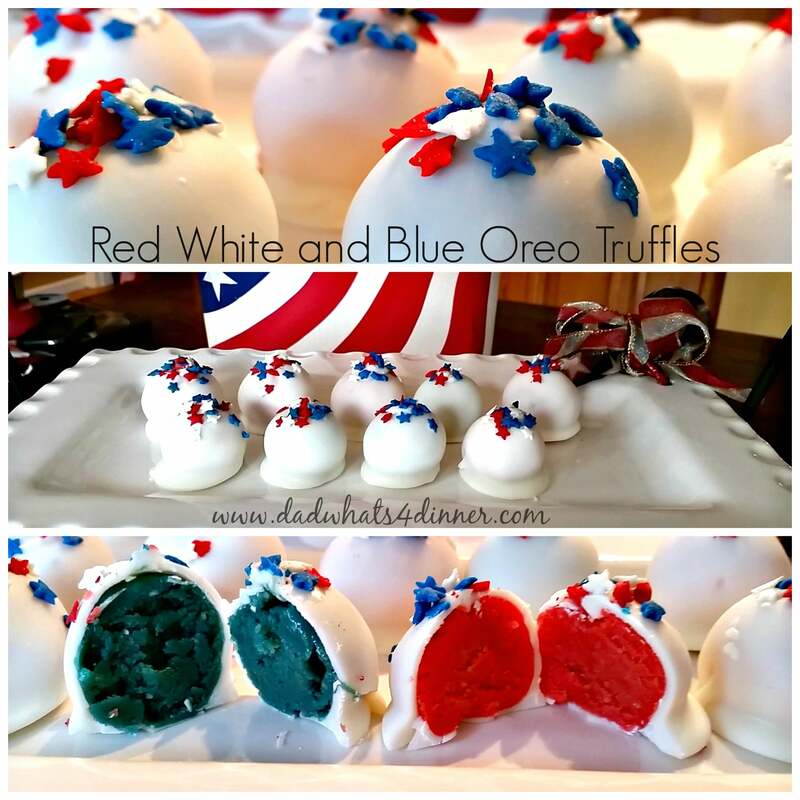 These Red White and Blue Oreo Truffles are a quick, no bake, easy dessert, for the summer cookout season. 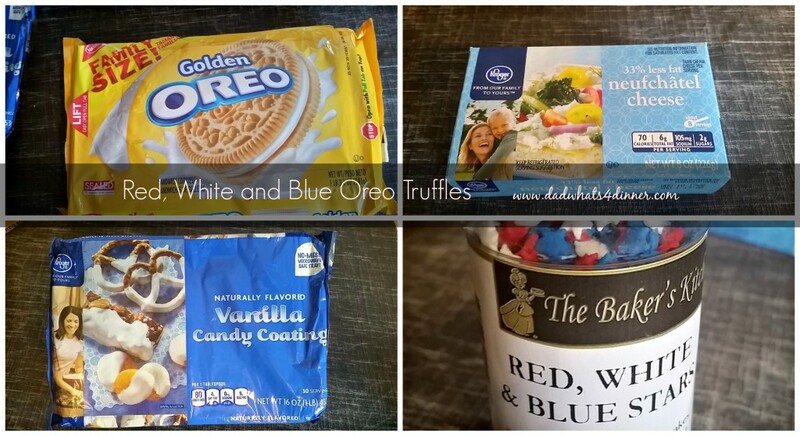 Place Oreo's in food processor and pulse until crushed to form fine crumbs. In a stand mixer, mix Oreo crumbs, cream cheese and salt until completely blended and no cream cheese pieces are showing. Divide dough in half. Return half of the dough to stand mixer and add red food coloring. Adjust coloring as needed until correct color is achieved. Clean mixing bowl and repeat process with second half of dough and blue food coloring. Prepare baking sheet by lining it with parchment or wax paper. Use a melon baller or small ice cream scoop, to form a ball and place on baking sheet. Place balls in freezer for at least 30 minutes. Remove balls from freezer and roll each in your hands to form a smooth round ball. Freeze for another 10 minutes. Melt 1/4 of candy coating according to package directions. 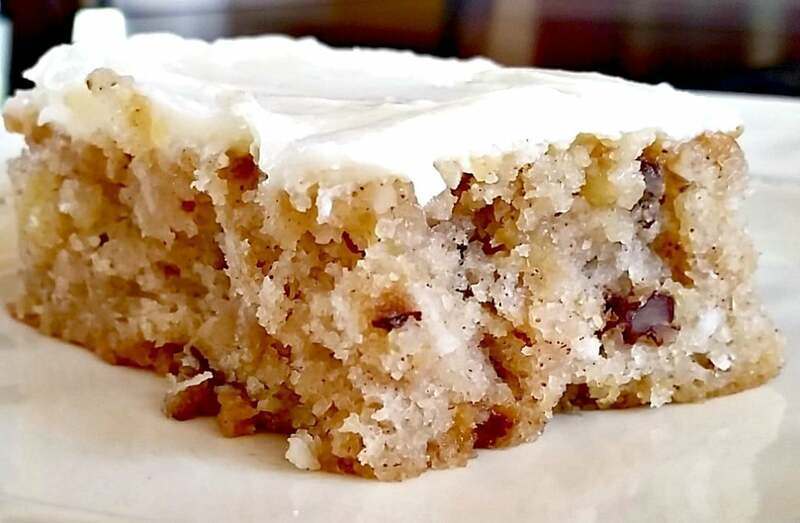 Working in batches, about 10 at a time, use a toothpick to dip ball in coating allowing excess to drip off and place on new baking sheet lined with parchment. Remove toothpick and use a spoon to place a small dab of coating over hole and add star sprinkles. Repeat with remaining balls and candy coating. Equipment needed: Food processor, stand mixer, half sheet pan or baking sheet, parchment or wax paper, melon baller or small ice cream scoop, toothpicks and a small microwave safe cup. These are so pretty! I can’t believe they were made with cookies. Great idea for the 4th! 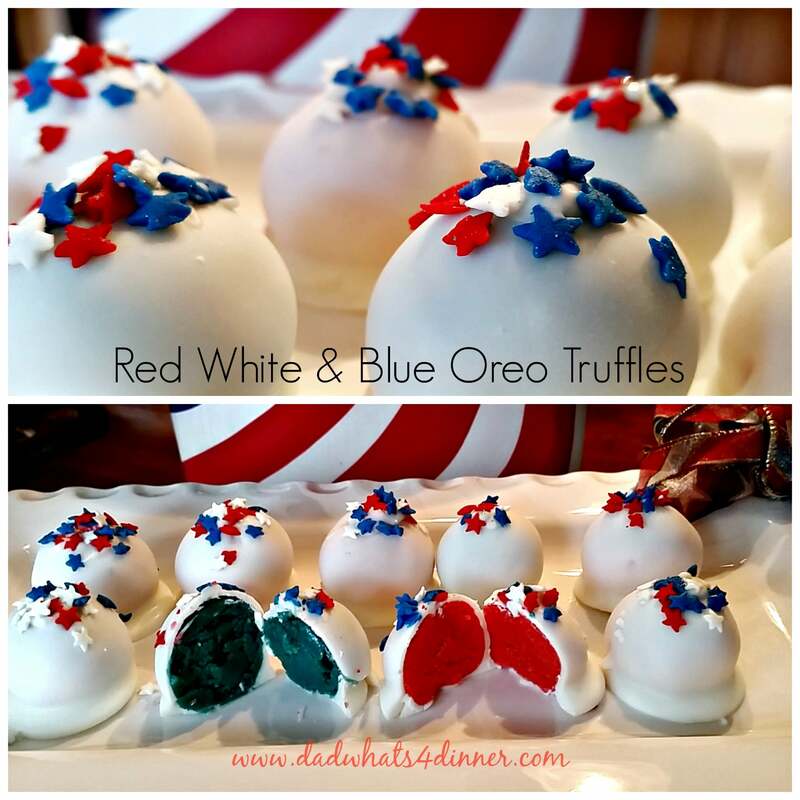 Thanks Shari.. Oreo balls or truffles are very easy a versatile and yummy. Kids love them. So festive! Thanks for linking to the Do Tell Tuesday party! Ah, I love this idea! They are so festive and sound delicious. It’s great how you wrote down the idea so late at night, sometimes creativity strikes us at the oddest times. Happy FF, and have a wonderful weekend! These are adorable! Who could pass these up? Not I:-) Thanks for linking up and sharing with us at Funtastic Friday. Please join us again this week. Thanks Sherry, they turned out great. Thanks for leaving a comment. 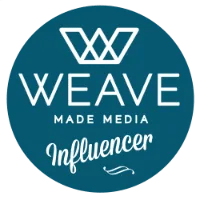 I just switched over to a self hosted site on Friday and I hadn’t received any new comments or likes. Was getting a little worried. :((( Trying to figure out if something was wrong. These look both tasty and so festive! Thanks for sharing at Celebrate the USA Party. Thanks for visiting. It is a great little trick. Have a great weekend. Fun! I just saw these @ Fiesta Friday- love it! It will give me an excuse to try golden Oreos! These Oreo truffles are every kid’s dream!! I guess you are so ready for the 4th of July, Quinn. These are so pretty and looking so happy. 😀 Thank you for linking up to this week’s FF party.